Folding projection screen for front or rear projection. Versatile and ruggedly constructed�sets up in minutes without tools. Professionals in training, corporate communications, show production... everyone who takes a show on the road will appreciate the many advantages of Cinefold. Front or rear projection surfaces, aspect ratios for every projection format, standard sizes from 56' to 14' wide. Add an optional Dress Kit for a cinema-like stage effect. Frame of sturdy I' square clear anodized aluminum tubing. All hardware is cadmium plated to resist rust. Frame attaches to legs with Handy Cranks�Xno tools. All components labelled and color coded for easy assembly. Viewing surface snaps on to frame for a smooth, wrinkle-free projection area. Entire unit folds into compact, luggage-like carrying case for travelling. Flexible matt white reflects crisp, bright images with excellent color rendition under darkened or semi-darkened conditions. Lightly embossed for uniform light distribution. Broad viewing angles for crowded rooms and large audiences. Washable. Packaged in protective leatherette carrying case..
Cineflex flexible vinyl film transmits sharp, brilliant images with excellent resolution and contrast, even in lighted or semi-lighted rooms. Neutral grey Cineflex is composed of millions of invisible, light-diffusing optical lenses. Its superior diffusion provides uniform brightness over a wide viewing cone, without �hot spots�. Washable. Packaged in a soft leatherette carrying case. Heavy - Duty Legs-Extra reinforcement against front-to-back movement. 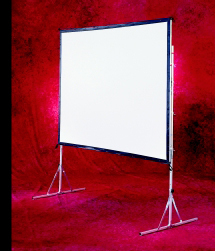 Recommended for any Cinefold 9' X 9' or larger; required with Dress Kit (A). Anti-Sway Stabilizers-XReinforce against side-toside movement. May be mounted either inside or outside Cinefold leg. Recommended for any Cinefold over 10 1/2' X 14', required with Dress Kits (B). Hinge Clamps and Masking Strips�Join two or more screens for multi-screen setups. Hinge clamp allows positioning of screens at any angle desired, masking strips conceal hardware and provide picture continuity. White masking for matt white; black for Cineflex. Straight clamps are also available. New Cinefold Carrying Case�This attractive new case offers many features for longer life and convenience. Built of polyethylene, with all belts, buckles, and handles recessed into the top of the case for easy stacking and moving. Wheels are optionally available, and each end is equipped with a handle and a label holder. Luggage-style buckles are easy to fasten.